The Milorganite Organic Nitrogen Fertilizer is derived from heat-dried microbes that have digested the organic material in wastewater. It is great for promoting healthy growth of lawns, trees, shrubs and flowers. The non burning formula doesn't have to be watered-in. It is fortified with 4% iron to help produce thick, green lawns without excessive growth. It doesn't contain any salts, so it is good for use in drought conditions. A 36 lb. bag covers about 2,500 sq. ft. to feed your lawn or garden for up to 10 weeks, so you don't have to constantly fertilize. Also this fertilizer stays in the root zone, avoiding groundwater or well contamination. Users like this fertilizer as it also works as repellent and deters rabbits and deer from eating plants. Some users say that that Milorganite Organic Nitrogen Fertilizer has a slight odor to it. 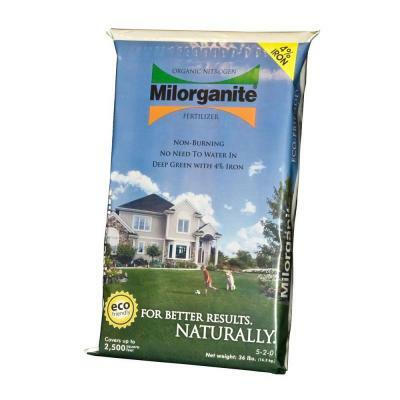 Overall, the Milorganite Organic Nitrogen Fertilizer is highly rated and highly recommended by users for growing thick and lush green grass. It comes at a very good price for the quantity and quality. The Milorganite C:N (carbon to nitrogen) ratio is 6:1. 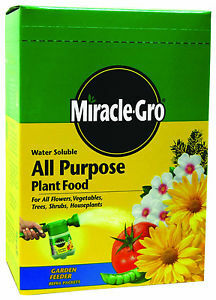 The Miracle-Gro 3001192 All Purpose Plant Food works for all flowers, vegetables, trees, shrubs, and houseplants. You just need to add a tablespoon of this water soluble plant food in the watering bucket for amazing results in the growth in your plants. It has dual feeding action as it feeds through both the roots and leaves. This plant food is easy to mix in water and use. Users find this plant fertilizer a good value for money. Overall, the Miracle-Gro 3001192 All Purpose Plant Food is great product for making your plants healthy and grow better. With Miracle-Gro 3001192 All Purpose Plant Food, you don’t have to be a great gardener to love the beauty of a lush, colorful garden. The Scotts Turf Builder WinterGuard Fall Lawn Fertilizer (Model: 38605A) is meant for using during autumn to protect your lawn throughout the winter. This easy to apply fertilizer is kid- and pet friendly and protects and strengthens your lawn for healthy results in the spring. The product is formulated so that every granule delivers all the necessary nutrients. It builds strong, deep grass roots for a better lawn next spring. The Water Smart design enables grass to absorb water easily as well as nutrients for excellent results. This fertilizer also replenish the nutrients lost in the harsh summer months. One bag covers about 5,000 sq. ft. and the slow-release formula lasts 6 weeks while preventing growth of weeds. Users are happy with the consistent quality results from this turf builder from Scotts. Overall, the Scotts Turf Builder WinterGuard Fall Lawn Fertilizer is highly rated and recommended by users as a seasonal treatment and feeding of lawns. Great for tomatoes, roses, pepper, basil, greens, parsley, cucumbers etc. 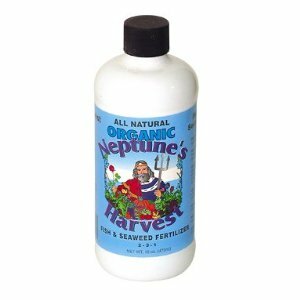 The Neptune's Harvest Organic Hydrolized Fish & Seaweed Fertilizer gives you the best of both products with a perfect blend of fish hydrolysate and seaweed, ensuring a complete fertilization program. Users using Neptune's fish/seaweed blend fertilizer on a regular basis have reported increased marketable yields and improved shelf life on fruits and vegetables. Fish and Seaweed are known to build the natural sugar in plants resulting in stronger and more colorful flowers and foliage. This fertilizer makes the blooms more plentiful, fragrant and longer lasting. This is a very well balanced organic fertilizer which is fast, easy and convenient to use. This organic blend fertilizer is great for all kind of plants including tomatoes, roses, pepper, basil, greens, parsley, cucumbers etc. Users find this to be a great deal for the price and quantity. Overall, the Neptune's Harvest Organic Hydrolized Fish & Seaweed Fertilizer is highly rated and recommended by users for the results it produces in their gardens, lawns and farms. Prepare for one application only. Lawns: Use 1 gallon concentrate mixed with sufficient water to cover 8000 sq. ft. Feed monthly during growing season and again in the fall. 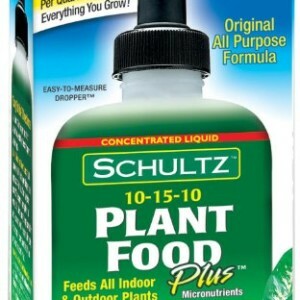 The Schultz All Purpose Plant Food Plus 10-15-10 feeds both indoor and outdoor plants. Mother Nature feeds plants every time it rains, which dissolves nutrients and distributes them evenly to all plants. Schultz Liquid Plant Food Plus does the same thing. The plant food instantly provides vital micronutrients every time you water. This plant food has the famous 7 drops formula, where just 7 drops per quart of water feeds everything you grow. It is excellent when transplanting, repotting and rooting. Users love the easy to use and measure dropper. 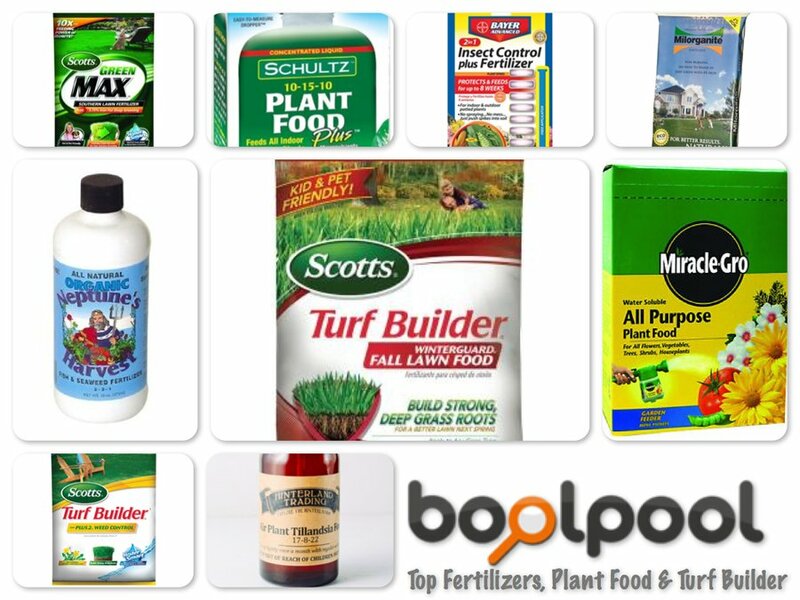 Overall, the Schultz All Purpose Plant Food Plus 10-15-10 is an inexpensive and effective plant food which provides a perfect mix of nutrients to your indoor and outdoor plants. Indoor Plants: Apply 7 drops (1/8 tsp.) per quart of water. When feeding once or twice a month, apply up to 14 drops (1/4 tsp.). Outdoor Plants: Apply 4 droppers (1 tsp.) per gallon of water every time you water. For once or twice a month, use up to 8 droppers. Use every time you water or once or twice a month. One full squeeze of the dropper dispenses approximately 14 drops. The Jobe's 5001T Houseplant Indoor Fertilizer Food Spikes help in keeping your houseplants healthy and fertilized very easily. Spikes provide a continuous supply of important nutrients right at the roots, where plants need it most. The premeasured, specially formulated spikes are simply inserted into the soil around your plant. Unlike liquids or granular, Jobes Houseplant Spikes eliminate mess, hazards and smells and cant wash through when you water to save chemical runoff. It can feed roots for up to 60 days and you don't have to worry about mixing fertilizers in water or remembering to fertilize. These spikes are very easy to use and store. 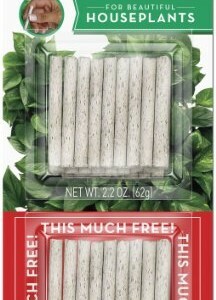 Some users find these good for aquarium plants too. Overall, the Jobe's 5001T Houseplant Indoor Fertilizer Food Spikes are very inexpensive and good product for fertilizing your plants. For best results, insert new spikes every 60 days. Just push each spike into the soil around the plant, halfway between the plant stem and the edge of the pot, until the spike is just below the surface. The nutrients are gradually released to the plant's roots safely and continuously, every day. Water after inserting spikes. 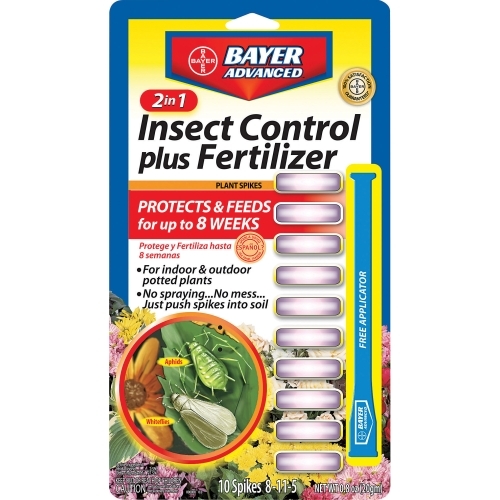 The Bayer 701710A 2-in-1 Insect Protection with Fertilizer Plant Spikes fertilizes plants for up to 8 weeks and also protect them against some insects and bugs. It does not need any spraying and comes with a free applicator that easily inserts spikes right at plant roots. This product works well for potted plants - indoors or outdoors and kills insects such as Aphids, Leafhoppers, Mealybugs, Plant bugs, Scales, Thrips and Whiteflies. The active Ingredients is Imidacloprid 2.5% which is known to break breeding cycle of gnats. A pack of these easy-to-use 10 Spikes can treat 10 five-inch potted plants. However, many user reviews mention that this product works as fertilizer but may not do a good job of killing plant insects. Overall, the Bayer 701710A 2-in-1 Insect Protection with Fertilizer Plant Spikes get mixed reviews from users. Many users highly recommend it and a few were disappointed that it did not help much with insects. 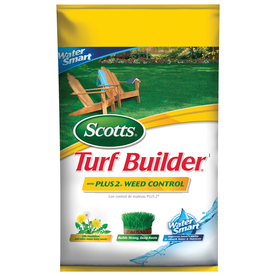 The Scotts Turf Builder Fertilizer with Plus 2 Weed Control (Model: 31805) provides 5,000 SqFt. of coverage to get a lush green lawn. This is a good fertilizer and helps in weed control by killing dandelions and other major lawn weeds like chickweed and other non-grassy weeds. This fertilizer can help in building thick, green turf from the roots up without burning your lawn. Its slow-release formula ensures extended feeding and improves lawn's ability to absorb water and nutrients. However, there are some disappointed users of this product. In some cases, it burnt the grass and made brown spots on lawns. Some users also reported that instead of killing weeds, it helps them grow. 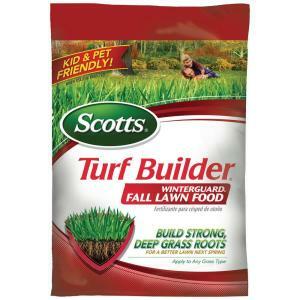 Overall, the Scotts Turf Builder Fertilizer with Plus 2 Weed Control (Model: 31805) is a good 2-in-1 formula for a lush green weed free lawn. The Hinterland Trading Air Plants Fertilizer is a premium quality Tillandsia air plant food. It is meant for using just once a month with watering for showy flowers in branched leaf clusters and handsomely marked flower clusters. It makes air plants have a brighter color, healthier looks and fast growth. This plant food come pre-mixed in a easy to spray compact bottle. It is very convenient and easy to use. However, it is a little expensive product but lasts long as it takes very small quantity with every use. 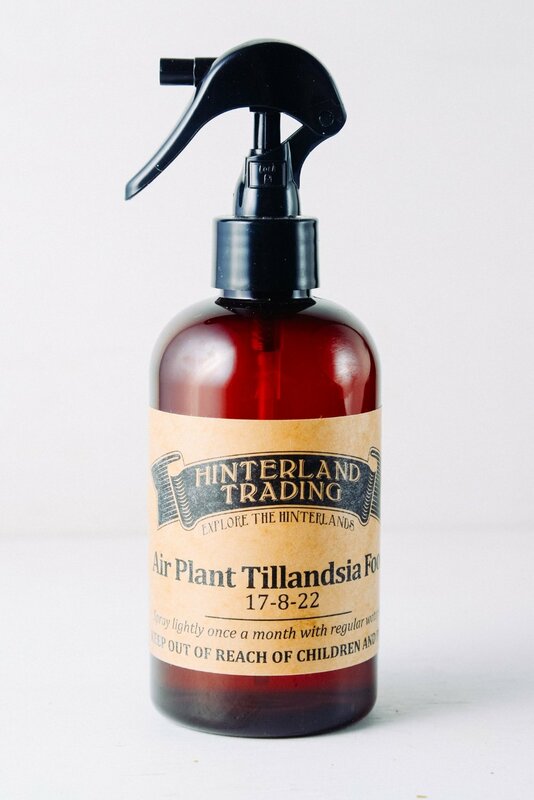 Overall, the Hinterland Trading Air Plant Tillandsia Food Air Plants Fertilizer is a wonderful and safe product for air plants. 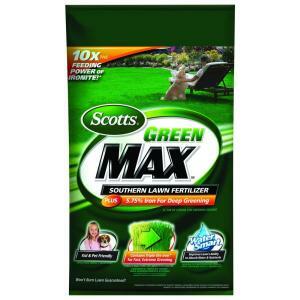 The Scotts Green MAX Southern Lawn Fertilizer provides an unique dual action 2-in-1 formula of lawn food plus iron to feed your lawn. It contains 5.75% iron, an essential micro-nutrient that enhances the natural greening process, so your lawn gets greener, faster. This kid and pet friendly fertilizer works great and makes grass plush and healthy green color. It retains the moisture and has essential nutrients for deeper greening in short period of time. However, many user reviews complain that this lawn fertilizer leaves permanent rust stains on concrete so you have to clean it very carefully from concrete surfaces before it comes in contact with water. Also, it may clump in the broadcast spreader easily to you may need a wider opening for spreading this lawn food. Overall, the Scotts Green MAX Southern Lawn Fertilizer is liked and used by many avid gardeners and home owners with lawns. Overall, the Scotts Green MAX Southern Lawn Fertilizer is liked and used by many avid gardeners and home owners with lawns. It comes in bag packaging for 2 coverage areas: 5,000 sq. ft. and 10,000 sq. ft.
Clean Up - Sweeping product from hard surfaces onto the lawn keeps product on the grass and prevents staining. Apply any season to any grass type. Feed every 6-8 weeks for your best lawn.